Summary: Bake It in a Cupcake takes the cupcake craze to the next level with 50 recipes for all kinds of sweet and savory treats baked inside cupcakes. These whimsical creations are presented in a bright, colorful format that looks as good as the cupcakes taste. All of Bake It in a Cupcake's creations are mouthwatering and fairly simple to make, even for those without baking experience. There is absolutely no doubt about it. BAKE IT IN A CUPCAKE: 50 TREATS WITH A SURPRISE INSIDE by Megan Seling is a very unique cookbook. The basic idea behind BAKE IT IN A CUPCAKE is that everyone can create cupcakes filled with fun surprises. And I don't just mean cream or fruit filled centers. These recipes include such interesting fillings as macaroons, pies, candy bars, cheesecakes, breakfast cereal, and even baklava! I couldn't get over how cute BAKE IT IN A CUPCAKE was -- so many great ideas. Of course, the cover alone basically guarantees that this cookbook is full of gorgeous color photographs; and I can assure you that all of the creations are positively beautiful, both inside and out. One of the recipes that I thought was the prettiest was for the "tie-dyed" cupcakes filled with pixie sticks. 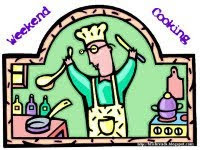 BAKE IT IN A CUPCAKE begins with some general baking tips and recommended tools for your kitchen. And then the fun begins! The recipe sections of the book are divided into the following chapters: Baked Goods in a Cupcake; Strawberries, Pineapple, Figs, Oh Yum! ; Breakfast of Champions; I Want Candy! ; Savory Treats; and Seasonal and Holiday Favorites. 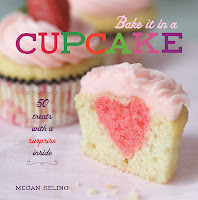 The author also includes some advice about building your own "bake it in a cupcake" creations. I admit my first reaction to this cookbook was just how original it was; and then came my reality check. Some of these recipes are kind of labor intensive. For example, I loved the idea of baking cupcakes filled with pies and even baklava; however, I quickly realized that I would have to actually bake the mini pies and baklava first! All kidding aside, the author does give some shortcut options like using pre-packaged pie crust and even buying ready-made small fruit pies. I guess my overall reaction is that many of these cupcake recipes aren't for kids (or at least my kids) because they wouldn't appreciate the time I spent making them. However, I do think they are the perfect dessert to serve to my book club friends. No doubt they are a conversation starter! I did find myself marking quite a few recipes to try. As much as I love desserts, I ended up buying ingredients for a cupcake that wasn't sweet. The first recipe I tried was part of the savory chapter, and it's called Brie-Stuffed Apricot Cornmeal Muffins. This recipe screamed out to me for two main reasons -- brie and dried apricots (yes, please!) and it was extremely simple. These cupcakes only took a few minutes to prepare, and I thought they were delicious! I enjoyed one hot from the oven and I also thought they made a good breakfast the next morning with a cup of hot coffee. I already have plans to make another recipe from the savory chapter -- Egg-Filled Croissant Cups with Swiss Cheese and Chives. This recipe allows you to cheat with premade crescent roll dough, so right off the bat, it's a little easier. There are only a few ingredients and I think they look adorable, not to mention delicious. I'm thinking of serving them for breakfast or at a brunch! I would be remiss if I didn't mention how many adorable dessert cupcakes are in this book too. Some of the ones that made my shortlist include: Snickerdoodle Chocolate Cupcakes with Hot Chocolate Frosting, Cheesecake-Filled Spiced Pumpkin Cupcakes with Nutella Frosting, Cinnamon Roll Vanilla Cupcakes with Vanilla Bea Glaze, and The Elvis: Peanut Butter-Banana Cupcakes! Is your mouth watering yet? Overall, I loved BAKE IT IN A CUPCAKE for its originality as well as the delicious recipes. It's definitely a cookbook worth checking out! This cookbook looks adorable!! :) Definitely a neat idea and LOVE the cover too!! I'm not much of a baker but I did just make a batch of cookies I was awfully proud of for two or three days. This sounds like such a fun cookbook! I would definitely be focussing on the sweet chapters though! The chocolate covered pretzel brownie bites with salted caramel frosting sounds like a mouthful and so delicious. What a cute book! I kept looking at the Egg-Filled Croissant Cups with Swiss Cheese and Chives recipe in this cookbook but of course, my guys want one of the cupcakes with mini pies inside. That recipe calls for cinnamon chips and I need to see if I can find some. This cookbook is gorgeous!!! I've been eying this one up because it is just too cute and I love how fun it is to find a surprise inside a cupcake. The savory ones appealed to me too. Between you and Kathy, all I want to do right now is pig out on cinnamon rolls and cupcakes. That one on the cover looks SO GOOD! With our nest now empty, I cannot justify all the sweets any more, but the savories sound possible and a good way to add variety. My 10-year-old would LOVE this cookbook. I'm not sure I'd be able to pull them together.